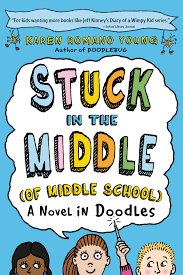 Stuck in the Middle (Of Middle School): A Novel in Doodles features the story of Doreen, also known as Dodo or Doodlebug, a young girl attending middle school with her two best friends. Doreen has ADD and she doodles almost constantly in order to “survive” her school day. Her doodles are comparable to a journal as they detail the events of her life. Doreen finds herself trying to solve problems that have come up in her life, including helping her little sister, Maureen, or Momo, to find friends her age at school, asking Marco to go to the school dance with her, and helping her dad to feel valued and appreciated while her mom’s career takes off. In the end she sets Momo up with “The Cootietts” to sing karaoke at the school dance, enjoys the slow dance she dreamed of with Marco, and reminds her dad of the art projects he enjoyed making in college. This book is appropriately titled A Novel in Doodles, but it makes for a challenge when reading it. The book is hard to follow, both literally and figuratively. Text is unconventionally strewn all over the pages, and while this provides a realistic sense of a handwritten doodle-book, reader will be confused as to what they are supposed to read when and how the story really goes. The thoughts are just as jumbled, the plot line is jagged and fails to connect events and ideas, and the several nicknames of Doreen and all her friends and family members make even the characters themselves hard to identify. Additionally, the title itself is never connected to the story. 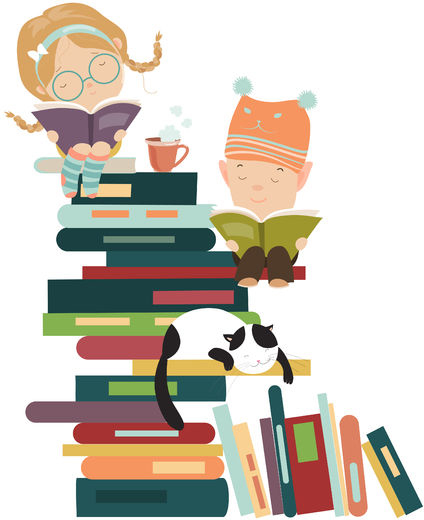 This book is based on a good idea, allowing children to experience a different format of writing/reading and experiences a unique narrative, but the execution thereof is poor.